Do you like being on a boat? You’re a cat after all and I didn’t think they like water? Yes yes and yes! The truth is I LOVE being on the boat! I’m known affectionately as ‘puppy’ by my humans who swear that I’m more like a dog than a cat. Even though I’m not too keen on getting wet, I occasionally jump in! When was your first boat ride? I adopted the humans when I was 10 months old. Within a couple of weeks I went on my first boat ride. We took it slowly at first, I had a day and a night to get used to just being on the boat. The next day we turned on the engine so I could get used to the noises and then once I was happy we went for a quick day sail. Errm… Yes, very embarrassingly I’ve fallen in twice now! I fell in one evening in the marina when I sneaked out a porthole for an adventure. (The humans have wised up to this now and have barriers to stop me.) It was very dark and I just misjudged the distance between the boat and the pontoon. The other occasion was very recently when I got too comfy and fell asleep on the transom and fell in! The humans have a big fishing net that’s always handy to scoop me straight back up again though. Unfortunately they don’t trust me to be outside on my own in the marina since I like to hop on other people’s boats so they’re always keeping an eye on me and ready to get me. When we’re on anchor I’m allowed inside and outside as long as the weather is good and we’re in a nice calm anchorage. I have a rope ladder that we make sure is hanging overboard which I can use to climb up, if I ever make the same mistake again. Have you ever chosen to go for a swim? Yes, once in Ponza! I’m not sure what came over me, but I decided to leap off the bow of the boat and do a couple of laps of Nocturne. The water is so clear there I just couldn’t resist I guess. As the humans walked towards the bow of the boat I turned and leapt off into the inviting water! The unusual behaviour shocked me just as much as it shocked the humans! Have you always lived on a boat? No I was 10 months old when my humans adopted me and gave me my furever home. I spend a couple of years commuting between a flat in Nice, France and the boat in Rome, Italy but now I live on the boat all the time! What’s the best thing about being on the boat? Oh definitely the freedom. I love being outside and watching all the wildlife and the stunning scenery and sunsets. Nothing beats being out on water. We’ve been lucky enough to see sea turtles and dolphins, starfish, crabs and thousands of fish. I’m always on the lookout for more marine friends. What’s the worst thing about being on the boat? Seasickness! I don’t usually suffer from it but if we are in a rolly anchorage and the humans start fussing about it, I sometimes feel a little queasy too. Luckily the humans don’t like it, so if we can, we tend to move, take a break on shore or sleep through it! What are your future plans on the boat? You say you’re a wannabe cruiser? Yes that’s right. The humans and I are planning and working towards setting off cruising. This means we are hoping to set off around the world on our beloved Nocturne. We’re hoping to leave ASAP. As soon as the boat and the cruising kitty are ready we’ll be off! What route do you intend to take? We don’t have a set route as such because we intend to be doing this for a long time so there’s no rush. We’d love to see more of the Med, do the Pacific circuit, the Northwest Passage looks like it would be a pawesome challenge and purrsonally I’d like to head to Alaska to see the bears! It would be nice to think that one day we might even do a circumnavigation but we’re happily going with the flow at the moment. Where did you get your lovely PFD? What brand is it? My life jacket is actually for small dogs-In fact I’ve got three now, but my prefurred one (the orange one in my profile picture) is from a brand called I.P.T.S which is a Dutch company. We got it in an independent pet shop in Nice in the South of France. I have the XS size. I’ve also got one from an American company called Critters Inflatables that inflates on impact with water, but I find it a little bulky with the gas canister. It would be purrfect for dogs though! I’ve also tried the West Marine pet lifejacket which is good. Sometimes I get worried when I see some of your photographs, why don’t you always wear your lifejacket? Well I LIVE on the boat so I can’t be expected to wear a lifejacket 24/7. It’s not fair and really not necessary. If we’re out sailing and I’m outside I wear it, mainly so that if I was to fall overboard the humans have something to grab onto with the boat hook or the net. Truth be told I’m excellent when we’re underway and tend to chill out in my travel case or go below decks. When we’re in the marina, I’m at home; I’m still young and like to take risks sometimes. I’ve ended up in the water on occasions but I’m only ever allowed outside if the humans are there (annoyingly) supervising that I don’t go hopping off onto other people’s boats. Therefore, if I end up in the water they are either watching me or hear the splash straight away. I’m a pawesome swimmer and I’m never in danger. It’s what we felines like to do…I don’t get the opportunity to impress by climbing trees and things, so I improvise and get humans hearts racing by doing a tightrope act along the lifelines! Definitely blue! The colour of the ocean! I’m the pest control officer aboard Nocturne and I’m very proud to say we’ve never had any problems with mice or other critters since I’ve been aboard. I’ll admit I sometimes struggle to keep the mosquitoes under control but they keep me fit and active as I hunt them. I have a toy mouse which I do daily hunting practice with. How did your book come about? A very pawesome senior-editor at Adlard Coles (the world’s largest nautical publishers) saw my blog and got in contact with me asking if I would be interested in writing a book! It was literally a dream come true! My human-mum is an aspiring writer and is a little envious I got a book deal before she did! Do you need any special papers or permits to be a Boat Cat? Since I’m in charge I’m a very well qualified Boat Cat! I’m French and we currently live in Italy so I have a French passport and all of my vaccinations and rabies jabs etc are always kept up to date. I’ve not ever left Europe yet but technically I’m already covered. I’m prepared! I need to sort out the humans’ vaccinations though! Who’s in charge on the boat? I am! Obviously! My dad’s the Captain, mum’s the First Mate. I’m the Admiral! Wow, thanks for the wonderful information Bailey! A trip around the world – you’ll be a world traveler! How interesting that Nocturne used to hang out in Alaska – so far away from Rome! Bailey I don’t know a more pawsome Admiral than mew! Mew OOZE coolness, like an Admiral Pirate. Sailing on the open sea around the world, mew WILL rule! well, if your journey ever takes you near southeast Virginia, we’ll have to meet up! Thanks Bailey – you are (p)awesome! Mum n me fink you iz da bestest see farin kitteh ever!!! That puts me in the picture. Pity you aren’t like Ginger William of Orange, who loved campervan travel. He hitched a ride with us in Upington, travelled through Namibia, and then came back with us to share our home in Durban. He didn’t get his own blog, but had a LOT of posts. I will be ocean crusing next year. My partner is doing the finishing touches on our boat, and then we are going to be-bug some things, and then we are off. I was worried about my pets. But seeing that you have your kitty with you, makes me feel secure that Loxley and Chuck will enjoy their adventure. I will be new to sailing, and learning as much as possible. Hi Bailey – I love your site. 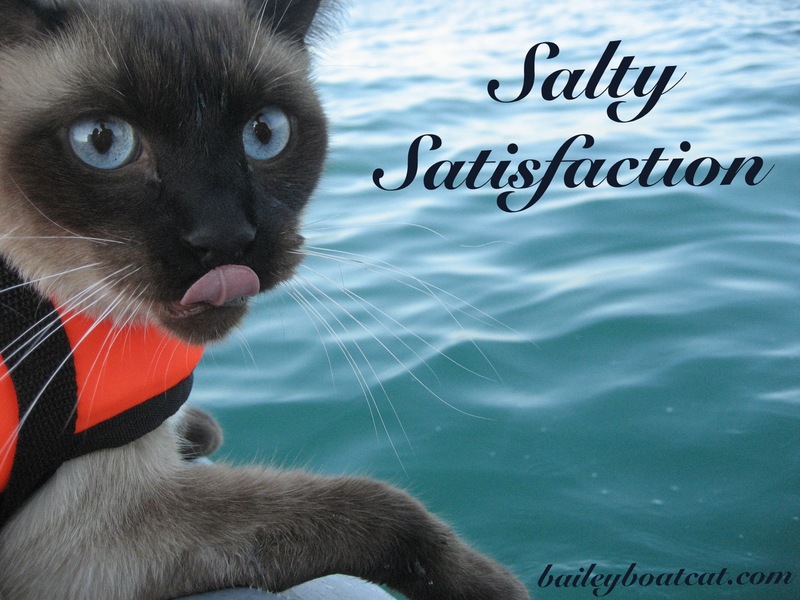 I don’t have a cat on my boat so I get my regular moggy fix by reading your blog. Keep up the pawesome work! Bailey, I´ve been told that your breed of cat are definitely more dog like than cat. I whistle for my Saffy cat and she comes a running. She even comes for walks with her best friend Bobby who is a dog and makes quite a lot of our English and Spanish neighbours chuckle to see her walking side by side with this big soppy dog. I´ve never tried to get Saffy to retrieve anything but she does sometimes eat the dog´s food even when I´ve told her not to and got a growl from her if I´ve tried to take it away. Mind you Bobby the dog loves her food, particularly her biscuits. Great job Bailey, one more question, how did you come by the name Bailey? My sister has a wonderful dog named Bailey, she named him after Bailey’s Irish Cream because she loved it. Also, I have preordered your book but here in USA we will have to wait until September to get it but that’s OK, gives me something to look forward to. Bailey, you are amazing. i’ve enjoyed every word in your bloggy, now I guess I’ll have to buy the book. M said she’ll do it today. You are one brave kitty to go climbing all over that ship with the threat of falling into the water with one slip of the paw. You have more courage than I do pal.